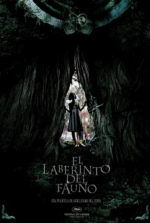 The Chronicles of Narnia: Prince Caspian tells of the magical land conceived of by C.S. Lewis some 1300 years after the first tale, yet only one year has passed for the Pevensie children, better known as “Sons of Adam” and “Daughter of Eve.” They return to their kingdom to inspire more Christian symbolism, finding their lands taken over by a human race called Telmarines, who in appearance and dress are none-too-distant from the Spanish. 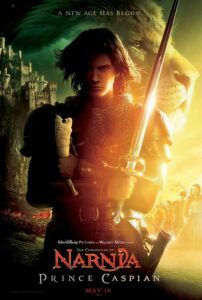 Teaming with the rebellious Telmarine Prince from the title (Ben Barnes) and inspired by the Jesus-lion named Aslan (voiced by Liam Neeson), our heroes assist in reclaiming their world via the armies of magic. 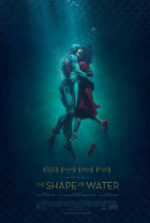 This sequel takes the same road as other fantasy franchises, reeling audiences with a cheery, innocent, childlike first entry, only to become darker and more adult as the stories (and moviegoers) progress. Except, Prince Caspian makes such a leap between its two films that younger audiences might find the experience too frightening. Indeed, when Harry Potter became too thematic, Warner Bros. allowed the PG-13 rating to accompany their film, raising both the dramatic potential along with the average age of their viewers. Walt Disney Pictures and Walden Media must’ve pulled some strings with their friends at the MPAA to keep the Narnia rating at PG. Not since before the inception of the PG-13 rating in the mid-1980s (thanks to Indiana Jones and the Temple of Doom) has a rating been so incorrectly placed. 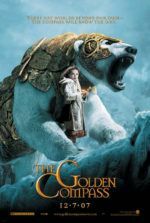 In an early scene, the “dwarf” Trumpkin (Peter Dinklage), the Pevensie’s pseudo-guide, takes down a wild bear, which he then proceeds to gut. “You may find Narnia a more savage place than you remember,” the dwarf explains. Indeed, the body count of dead reaches well into the hundreds. Granted, blood doesn’t spray and limbs remain attached unlike most swordplay epics, but people—not mixed creatures as in the first, removing the fantasy element—die left and right. And little Lucy (Georgie Henley) never goes from corpse to corpse to revive them, as she did after the big finale in the first film. We see mice soldiers, led by Reepicheep (voiced by Eddie Izzard), albeit cute, cut down endless soldiers with petite swords to the throat and eye. Bodies are tossed about in combat like rag dolls. Arrows jet into bodies by the stack. Since this sequel is grounded in seemingly continuous battles, the death toll rises higher than most children will be able to handle. I can’t deny that director Andrew Adamson has improved between the two films, nor can I dispute the increased quality of the production value. Computer-generated characters have more dimensionality, makeup effects look more natural, and the most interesting characters, the Narnians, are given further depth. These pluses don’t mean the end product is involving, however. Quite the opposite. Perhaps the production spent so much time perfecting the so-so effects from the first film that they forgot to give those Pevensie children some acting lessons. With the exception of Georgie Henley’s sweet, expressive face as Lucy, the children feel blank and one-note in comparison to, say, the child actors from the Harry Potter series. Consider how every child at Hogwarts has a distinct personality and depth; they’re full-fledged characters, making some of the most enjoyable scenes in J.K. Rowling’s world the idle chatter between students. Here the motivations for the Pevensie siblings are distant, if not altogether nonexistent. The eldest, Peter (William Moseley), seems determined, almost obsessed about asserting his battle readiness, though no explanation is offered as to why. Susan (Anna Popplewell) blossoms into a young woman, but the issue is barely explored. And I think Reepicheep the mouse had more lines than Edward (Skandar Keynes), whose role in the first was so significant. All efforts to make these children appealing result in sloppy, forced character-building devices. When the Pevensies initially return to their world of magic, we struggle to understand what’s at stake within their family unit. In The Lion, the Witch and the Wardrobe, Narnia helped them escape the confusion of oncoming war and sense of abandonment from their mother. They bickered with one another, and in the end resolved their internal struggle and grew up in the process. Prince Caspian turns them into background garnish for lavish effects and overlong battle scenes, no conflict of their own to resolve outside of Narnia’s, therefore nothing bonding us to their characters. Though visually superior to the first, this entry squanders the series’ already diminutive emotional potential, matching the first in its underwhelming effect.